Pakistan Military Kills Al Qaeda Leader Indicted in U.S. The Pakistani military announced it carried out a raid this weekend on an al Qaida hideout in South Waziristan, killing AQ leader Adnan G. el-Shukrijumah, a naturalized U.S. citizen indicted for terror crimes in the U.S. The Associated Press today reports that ISIS is not a danger to America, but another Islamic extremist group, Khorasan (aka Khurasan), which is affiliated with al Qaida in Pakistan and Afghanistan and the Taliban, is working with Yemeni bomb-makers from AQAP to launch an attack inside the U.S.
Former Pakistani president Pervez Musharraf said on CNN tonight that our entry into Pakistan to kill Osama bin Laden was an act of war. Also today, Pakistan told the U.S. to shut down its fusion cells and its troops in Pakistan. There's an attack on a Pakistani naval base in Karachi. Several have been killed and there may be hostages. This is the Navy base. The assets destroyed include two expensive P-3C Orion surveillance aircraft we provided Pakistan. Pakistan's intelligence chief, Ahmed Shuja Pasha, appeared before the country's Parliament today. He acknowledged their intelligence failure over Osama bin Laden, offered to resign and blasted the U.S. for invading Pakistan's sovereignty to conduct the raid. He also denounced U.S. drones in Pakistan. After his appearance, Parliament passed a resolution that condemned the raid and called for a re-evaluation of Pakistan's cooperation with the U.S. and revamp the security agencies so there would be no repeat. They were all college students. They had deep interest in the religion and they were of the opinion that a Jihad must be waged against the infidels for the atrocities committed by them against Muslims around the world. Among them Ahmed Abdullah Minni used to regularly visit the internet page of YouTube. He used to the praise the videos which showed attacks on the US Army and Installations. This became a regular feature and Minni, a registered user of YouTube, regularly praised such attacks. Soon after, Minni was contacted by a person named “Saifullah”. Former FBI translator and whistleblower Sibel Edmonds has new and damning allegations against at least one senior Pentagon officials in the Bush Administration. Musharraf must go. 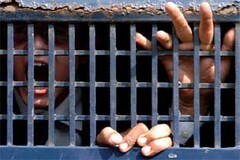 Hundreds more lawyers were arrested in Pakistan yesterday. The photo is of lawyers shouting slogans as they are being hauled away in police vans and accompanies this Scotsman article describing the lawyers being beaten. Lawyers protesting yesterday outside the courts in Karachi and Lahore were thrashed by baton-charging police amid clouds of tear gas. About 350 of them were rounded up in Lahore. Lawyers, judges and human-rights activists appear to have been deemed the enemies of the regime, as the country slides towards totalitarian rule. Since Saturday, between 1,500 and 2,000 have been incarcerated. "On the pretext of fighting militants, General Musharraf has mounted a coup against Pakistan's civil society," said Brad Adams, the Asia director at the campaign group Human Rights Watch. "It's clear it is aimed solely at keeping himself in power." CNN is reporting Pakistani President Pervez Musharraf has declared a state of emergency and suspended the Constitution and imposed martial law. I haven't been following Pakistan much, what's going on? 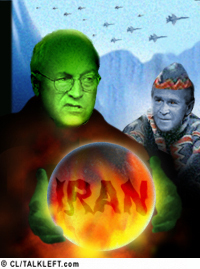 If Iran had a nuclear weapon, it'd be a dangerous threat to world peace," Bush said. "So I told people that if you're interested in avoiding World War III, it seems like you ought to be interested" in ensuring Iran not gain the capacity to develop such weapons. "I take the threat of Iran with a nuclear weapon very seriously," he said. In the mail today, I received an unsolicited advance copy of the book released Tuesday, Deception: Pakistan, the United States and the Secret Trade in Nuclear Weapons by Adrian Levy and Catherine Scott-Clark.